The brains of children from low-income families process information differently to those of their wealthier counterparts, US research suggests. Normal nine and 10-year-olds from rich and poor backgrounds had differing electrical activity in a part of the brain linked to problem solving. The Journal of Cognitive Neuroscience study was described as a "wake-up call" about the impact of deprivation. A UK researcher said it could shed light on early brain development. The 26 children in the study, conducted at the University of California, Berkeley, were measured using an electroencephalograph (EEG), which measured activity in the "prefrontal cortex" of the brain. Half were from low income homes, and half from high income families. During the test, an image the children had not been briefed to expect was flashed onto a screen, and their brain responses were measured. Those from lower income families showed a lower prefrontal cortex response to it than those from wealthier households. Dr Mark Kishiyama, one of the researchers, said: "The low socioeconomic kids were not detecting or processing the visual stimuli as well - they were not getting that extra boost from the prefrontal cortex." Since the children were, in health terms, normal in every way, the researchers suspected that "stressful environments" created by low socioeconomic status might be to blame. Previous studies have suggested that children in low-income families are spoken to far less - on average hearing 30 million fewer words by the age of four. Professor Thomas Boyce, another of the researchers, said that talking more to children could boost prefrontal cortex development. "We are certainly not blaming lower socioeconomic families for not talking to their kids - there are probably a zillion reasons why that happens." 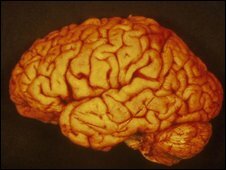 His colleague, Professor Robert Knight, added: "This is a wake-up call - it's not just that these kids are poor and more likely to have health problems, but they might actually not be getting full brain development from the stressful and relatively impoverished environment associated with low socioeconomic status." He said that with "proper intervention and training", improvements could be made, even in older children. Dr Emese Nagy, from the University of Dundee, said that it was a "pioneering" study which could aid understanding of how environment could affect brain development. She said: "Children who grow up in a different environment may have very different early experiences, and may process information differently than children from a different environment. "The study showed that low socioeconomic status children behaved exactly the same way as high socioeconomic status children, but their brain processed the information differently."